AVR-X4300H is rated 3.9 out of 5 by 14. 9.2 Channel Full 4K Ultra HD AV Receiver with built-in HEOS wireless technology, Dolby Atmos, DTS:X, unparalleled music playback options, thanks to our built-in HEOS technology, Apple AirPlay 2, and Amazon Alexa voice compatibility for seamless control. Full wireless connectivity is provided via Wi-Fi and Bluetooth, while Apple's Airplay 2 is supported for simple wireless music streaming. High-resolution audio formats and playback are fully supported over network streaming for incredible fidelity. The powerful amplifier section features discrete output devices on all seven channels, each of which is configured identically and rated at 125 watts (8 ohms, 0.05%THD, 20Hz~20kHz), while its high-current design means the AVR-X4300H can even drive lower impedance 4 ohm speakers on all channels. And you can control it from your smartphone or tablet using the free "Denon 2016 AVR Remote" app, available from the Apple app store, GooglePlay, and the Amazon app store. Built-in HEOS technology allows the AVR-X4300H to become part of the HEOS wireless multi-room system, allowing you to enjoy your favorite music anywhere – and everywhere – around your home. Share music stored on your home network, Internet radio or streaming services with HEOS wireless speakers, or even other HEOS-capable receivers, throughout the house. And it's all controlled by the free HEOS app, installed on as many smartphones and tablets as you like! The app gives you instant multi-room audio control, meaning you can command music in every room from any device: play different music from different sources in every room, group several rooms together and play the same song. Learn more about the full HEOS line-up. By fully immersing the listener in a cocoon of life-like sound, Auro-3D puts you right in the middle of the action. Auro-3D provides an immersive surround sound experience thanks to dedicated height and overhead channels, in addition to the regular channels. The height information, captured in recording or created during the mixing process, is mixed into a standard 5.1 PCM stream that comes with a regular Blu-ray. Moreover, the Auro-3D Engine combines different technologies to guarantee an optimum 3D sound experience generated both natively and from existing audio content. It recognizes mono, stereo, 5.1 surround or an Auro-encoded signal and transforms them into 3D audio. Once upgraded with the Auro-Codec decoder, the Denon AVR-X4300H is capable of decoding the original Auro-3D mix and playing back an Auro-3D 9.1 or 10.1 channel configuration (with external amplifier). Auro-3D Upgrade can be purchased for $199. 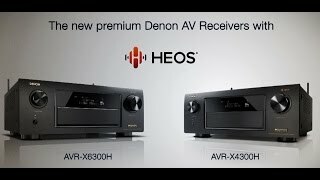 The exclusive Denon Link HD system, available when the AVR-X4300H is used with a compatible Denon Blu-ray player, creates a high-accuracy digital link, with a dedicated connection for master clock data to eliminate distortion caused by jitter errors in the main audio datastream. Meanwhile AL24 Processing Plus – another exclusive Denon technology – provides ultra-high-resolution digital audio filtering and precision in the main (L/R) audio channels, to deliver music with outstanding high-frequency detail along with a smooth, natural midrange, creating a natural soundstage with enhanced imaging. Featuring Bluetooth and Wi-Fi wireless streaming connectivity, the AVR-X4300H is equipped with an advanced dual antenna system for robust and error-free streaming even in congested urban environments. Connected to the Internet through your home Wi-Fi network (or with a hard-wired connection via the RJ-45 Ethernet LAN port), it allows you to enjoy your favorite tracks from streaming music services such as Spotify Connect. You can also choose from thousands of Internet radio stations from around the world, and enjoy music and speech entertainment of virtually every genre. AirPlay 2 lets you play your favorite tracks wirelessly from your iPod touch, iPhone or iPad, and via network streaming you can listen to music files stored on your home PC or Mac, or NAS devices. Rated 2 out of 5 by Soundone from great sound but failed after 18 months Initially everything was great about the Denon 4300H receiver but after 17 months it started to shut off every 30 minutes and then more frequently until it died completely. Apparently a common problem with Denon receivers. As with so many other receivers the front is in black with small black buttons and dark type labeling the functions. The remote control is very poorly designed with buttons that are exposed that if touched can easily change settings and then it is difficult and time consuming to get the receiver working again. My old Denon receiver had buttons not needed for regular operation at the bottom of the remote and covered with a plastic flap. Rated 5 out of 5 by SteveW from Upgrade from Denon 4100 I purchased this brand new 4300H from Fry's with discount replacing Denon 4100. It's worth more than every penny. There are three major improvements, 4K video on 4K LG TV, 4K sound with Atmos setup and soud playing music via Bluetooth. In general, the sound is much clear and fuller than before. I'm very happy with the upgrade. The remote, the setup and calibration are about tbe same as 4100. iOS app is not fully functional. Rated 5 out of 5 by HNL Bill from Flexible Powerhouse with HEOS Integration I plugged this AVR directly inot my wireless router to support streaming better. The unit has a much better GUI (graphical user interface) than my old reciever, which speeds setup, and makes it easier. The unit automatically selects the surround sound mode when watching movies, which is just plain awesome. The sound quality is very, very good (IMHO, not as good as my former NAD receiver, but good enough for today's content). I love the ability to play music using the HEOS app from my iPhone. Highly recommended! Rated 5 out of 5 by ErikT595 from Good value for money Just got this receiver for about a week now and am very happy with it. I sold my old Pioneer receiver and at first bought a new Pioneer Atmos receiver. The new Pioneer was disappionting. After returning i bought this one. What a beast is this, great power and very good sound quality with also very good sound effects and easy to use and with good looks. Only con is it's getting pretty hot. Rated 5 out of 5 by FlatTire from Best Bang for the Buck Bought this Denon to replace a Yamaha at the core of my family room TV home theater. While upgrades are never quick, we upgraded speakers (Bose) and receiver fairly quickly. But the best thing is that the sound is excellent. I highly recommend this receiver. Rated 4 out of 5 by Steveoboogie from Excellent but needs the right speakers! I had tried a few receivers before getting this one. It’s not the easiest to get the perfect sound I read about but it did deliver. I originally had Axiom speakers which were trash. Once I bought better speakers the sound came to life. The reason for four stars is due to the fact that the first one I received was defective. Extra added bonus of DSD support for my SACD player. Excellent built in phono amp if you love your vinyl. I tried using a phone amp but when I compared it to the internal phono amp it was just as good. Rated 5 out of 5 by Seta from BIG BANG FOR THE BUCK The 4300 is an awesome device, I am pre-amping the two fronts and letting the Denon breath with the rest of the set up 7.1. One issue I am having and it is not Denon's fault is that I am using a Roku ultra that is fighting against all other devices, if I tried to switch to other inputs like Blu-ray player, CD etc it would jump back to the Roku, really annoying. I was forced to pull it out and connect it straight to the TV. Rated 4 out of 5 by GusGus from Denon AVR-X4300H I somewhat upgraded from the Denon AVR-X4200W to the Denon AVR-X4300H. The only reason why I got the X4300 was due buying it on sale for about $800 dollars. I sold my X4200 for $500, and I only spent $300 more for the X4300H. I can say that the X4300H GUI is about the same as the X4200. All the connections are about the same as well. I've noticed some upgrade regarding 4K content, but since I do not have a 4K TV as of yet, I cannot say anything about this. I can say that I did noticed better sound quality when streaming music via HTPC with Tidal or Spotify HiFi, which is mainly what I use the AVR for. Movies wise it sounds about the same as my previous X4200. I'm currently using a 5.1 set up. Chane A5rx-c front left/right, Chane A2rx-c center, and 2 Cambridge Minx21 as surrounds. The 2016 Denon App works okay, and it has some EQ options. I would recommend upgrading from the X4100 / X4200 to the X4300 if you can find it on sale for around $800. Otherwise, I wouldn't recommend paying full price for the X4300 since the X4400 should be coming out anyways.